Below, we shed light on a very important B2B Magento 2 module that can be used for B2C as well. Meet the Price System Magento 2 module by AIRBYTES. This tool is designed to add multiple price and discount types to your Magento 2 website. 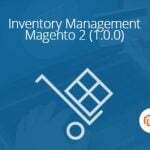 Install the Magento 2 extension, and you will easily get the ability to leverage individual prices and discounts, category specific customer prices, complex pricing rules, group prices, price lists, etc. The functionality of the AIRBYTES Price System Magento 2 extension can be divided into several groups. Let’s start our exploration of the module from customer individual prices. It’s no longer necessary to assign customer specific prices on per product basis – you can use individual customers as a basis. Furthermore, the extension supports various tier prices. And due to auto suggest search, you can easily find all the necessary products and even assign some data automatically. The ability to use individual prices allows you to fully leverage customer specific discounts. You just have to use a percentage value in the appropriate field. And if you already have a list of individual prices, the AIRBYTES Price System Magento 2 module allows you to import them via CSV. Moreover, with the help of the REST API interface, you can add a bunch of automatization per HTTP. And integration with various ERP systems is not a problem for the Price System Magento 2 module. As for category specific prices per customer, they can be also leveraged with the extension. As in case of individual prices per product, you can easily leverage tier prices and the autosuggest functionality. Turning tier price value into a discount is no longer a problem, so category specific discounts per customer are possible. Global discounts is another important feature available on AIRBYTES Price System for Magento 2. It means that you can apply a discount for all product in your catalog on per customer basis. Note that the original product price is used to calculate the discounted one. The same logic is applied to customer group-based discounts. Now, let’s tell a few words about price lists. This feature allows to make connections between your products and various customers and customer groups. You can even apply price lists for certain time intervals. The REST API interface can be utilized to manage price lists. Another important feature of the Price System Magento 2 module is related price ranges. Assign specific price ranges to determine which price should be applied for which product or customer. Thus, it is possible to determine when to apply the highest price, apply the lowest one, or a specific range. Now, let’s tell a few words about import functionality of the module. The AIRBYTES Price System Magento 2 extension allows to import customer individual and customer specific prices with customer specific discounts, category specific prices and discounts, as well as price lists. These were the core extension’s features, so let’s dive deep into its backend functionality. First of all, we’d like to draw your attention to settings. Go to Stores -> System -> Configuration -> MAGEB2B -> Pricesystem. Here, you can see 4 sections of settings: General settings, Pricelist settings, Customer, and Product. 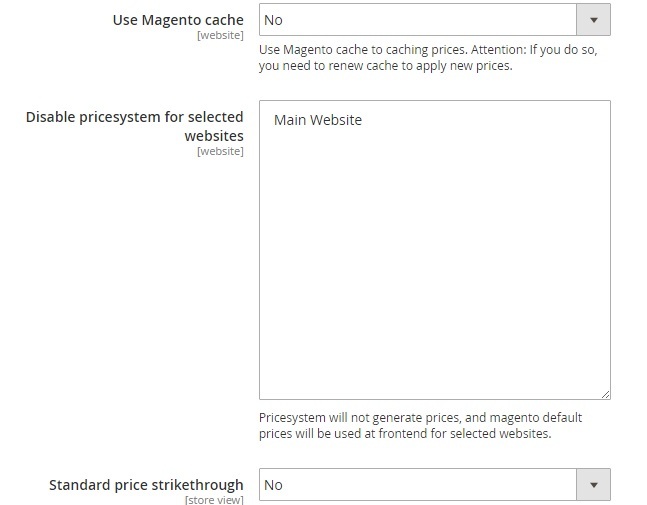 In General settings, you can enable/disable cache, select store views to disable the extension for, display the strikethrough price in addition to the custom one (to indicate the provided discount),select price types to be hidden, and connect the module with layered navigation. In Pricelist settings, you can configure just two parameters: “Load product id by sku during import” and “Reindex Pricelist via partial indexer on update”. The Customer section allows to activate “Show my prices under my account”. In Product settings, you can configure the aforementioned feature by selecting its value (Lowest, Highest, or Sort Order) and specifying price in sorting. Now, go to Customers -> All Customers and select a customer: in the Customers grid, find the Action column and hit the Edit link. Find the Pricesystem tab. Here, you can apply a discount for all products. As for customer group discounts, the extension requires to specify a group name, select a tax class, and set the discount amount. Action – edit or delete each price list here. For each price list, you can add as many products as you need under the Products tab. Note that it is possible to edit each product in the grid manually. On each Product Information page, you can select products, specify price and quantity, decide whether it is percent or no, and specify time interval. Under the Customers tab, you can add customers to your new price list. Next, you can select customer groups. The last tab allows you to specify such data as price list name, status (active or not), schedule (From date/To date), and store view. By installing the AIRBYTES Price System Magento 2 extension, you will be able to apply individual approach to your customers. Note that the default Magento 2 doesn’t provide this vital for B2B functionality, so the module is extremely important for all B2B merchants. Furthermore, nobody restricts you to fully leverage it for B2C business, so you get a great opportunity to add an extra layer of motivation for your retail clients. As for the price of the Magento 2 extension, it is € 1999 – definitely not the lowest one in the ecosystem. 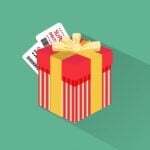 If your budget doesn’t allow you to spend such a great amount of money, check the following extensions that provide similar features: Customer Price Rules by Ecomwise, Prices per Customer by Mageworx, and Customer Group Restrictions by aheadWorks.